The Office for the SKA Organisation (SKAO) is responsible for coordinating the global activities of the SKA project. This includes engineering, science, site evaluation, operations and public outreach. About the SKAO In 2012, one of the most momentous decisions in recent scientific times was taken with the decision to co-site the Square Kilometre Array (SKA) in the deserts of South Africa and Australia. This unique project is set to test the limits of human engineering and scientific endeavour over the next decade. In 2013, the SKA Organisation located to an equally unique new facility. One which will be home to the team who will manage the construction, design and scientific output of these ground breaking telescopes. 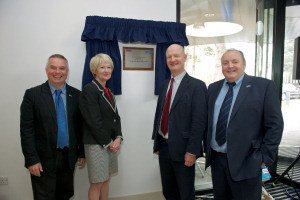 In front of a throng of local and global dignitaries, scientists and engineers, the SKA’s international headquarters was opened by the UK Minister for Universities and Science – David Willets MP.